“From the hills of Kaycee, Wyoming, where life’s wooly and wild” That is the opening line of the Garth Brooks song “Good Ride Cowboy”. About an hour into our travels, we drove through Kaycee. Don’t blink! This is more of a wide spot in the road than a “town”. I am going to say that Kaycee has more songs written about it per capita than any other town I know of. The countryside is gorgeous up here. Driving down the interstate, to the west was the Bighorn Forest, and to our east you could not see a tree or shrub for miles. The pronghorn love these wide open spaces. We started seeing large numbers of them yesterday. 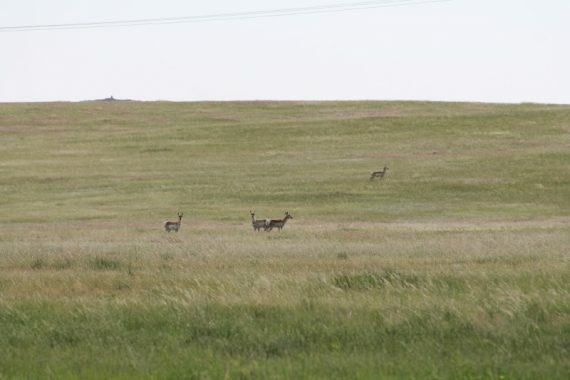 These pronghorn were very interested in us when we pulled the car over for a picture. A stop in Sheridan, Wyoming was the next event that got us out of the car. 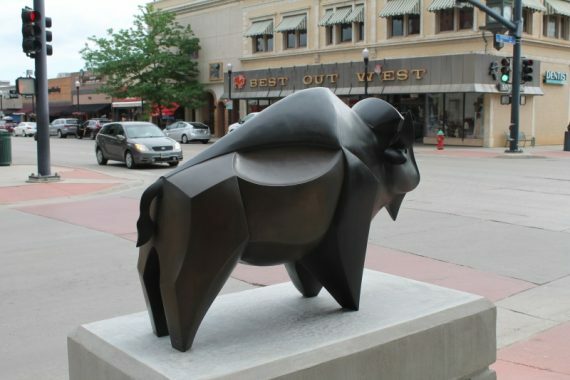 Their downtown is fairly vibrant, with the streets and sidewalks being recently replaced. There were some interesting stores we checked out, but being that it was 9am on Sunday morning, nothing was open but places to eat. 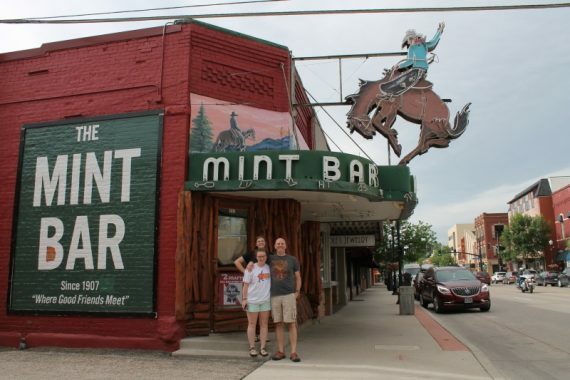 The Mint Bar is Sheridan’s oldest bar. Epic sign. We stopped by the Sheridan Inn, which was built in 1893 and was considered the finest hotel between Chicago and San Francisco. It was built by the railroads in their effort to encourage tourism and ridership of their trains. Buffalo Bill Cody managed the hotel for 2 years, and is said to have auditioned people for parts in his Wild West Show while sitting on the front porch. The hotel has been completely renovated. It was gorgeous inside and out. We couldn’t get over how lush the yard was. Marissa and Stephanie bought painted rocks in the gift shop. Must find more gift shops. 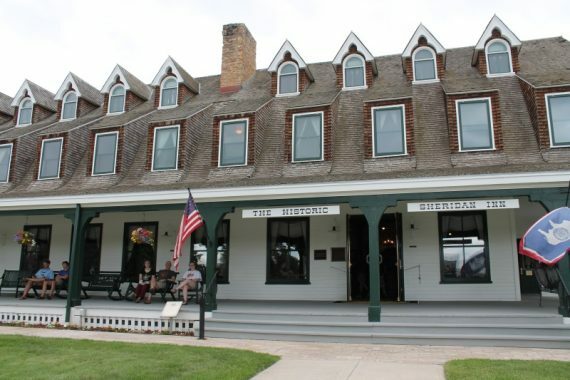 Chilling on the front porch of the Sheridan Inn just like Buffalo Bill. 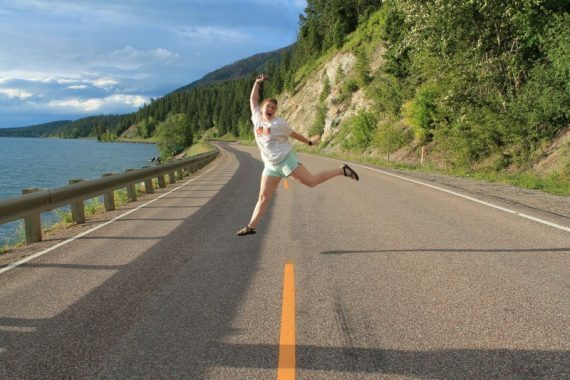 With our Sheridan sightseeing complete, we hit the road bound for Montana. 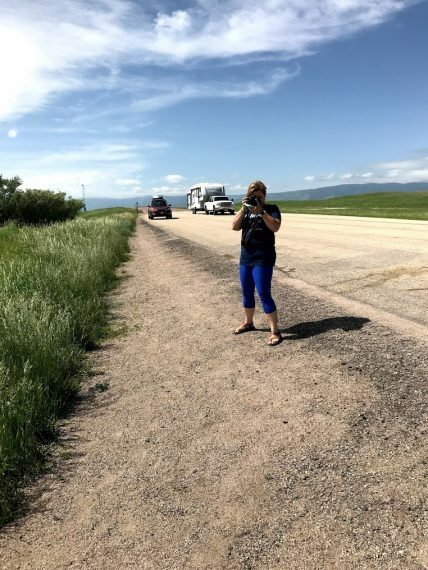 Behind the Scenes Look: Stephanie taking a picture at the Montana State Line. The first mile marker inside Montana that I noticed was 550. Good grief, Montana, settle down a little bit. 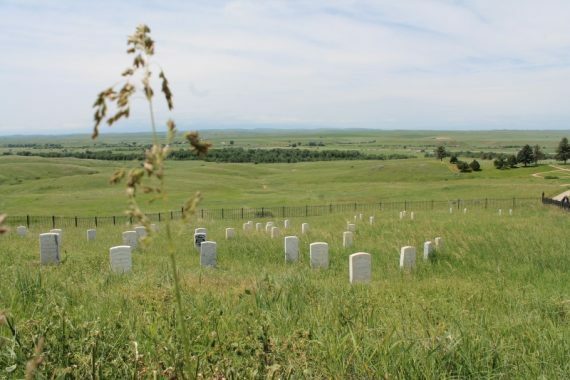 We didn’t get very far inside Montana before coming upon the Little Bighorn Battlefield National Monument. This was a pretty neat stop and I wish we could have spent more time. The Visitor Center was dated, but had a nice little gift shop(!) and exhibit. Mallory, as often happens to her, got cornered by a man from Florida and he told her all about his friend from Oklahoma City whose dad was killed in a hay bailing accident. Mallory has a knack for finding people that want to share more than what is socially appropriate. We wandered up the hill from the Visitor Center and inspected Last Stand Hill. Every spot where a U.S. Soldier was killed there is a white headstone. For spots where notable Native Americans were killed, there was a red granite marker. 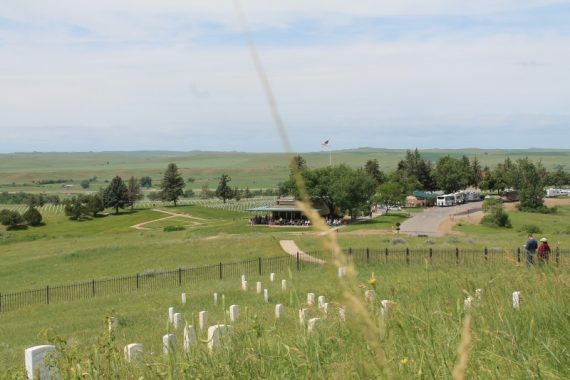 General Custer’s headstone has the black accents to make it easier to identify. You can look down from Last Stand Hill and see the National Cemetery. The Visitor Center was the home of a Ranger talk when we walked by. He had a very large audience. Again, with more time, that would be an awesome thing to hear. There is also an Indian Memorial with many quotes from the Indians who fought in this battle, as well as names of Indians who were killed. It was very well done. 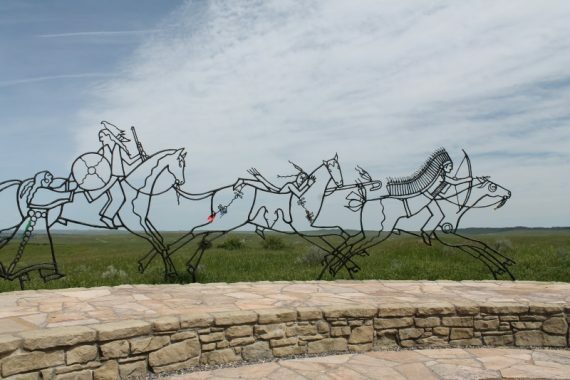 The focal point was a piece of artwork depicting several horses and riders. Indian Memorial at Little Bighorn. 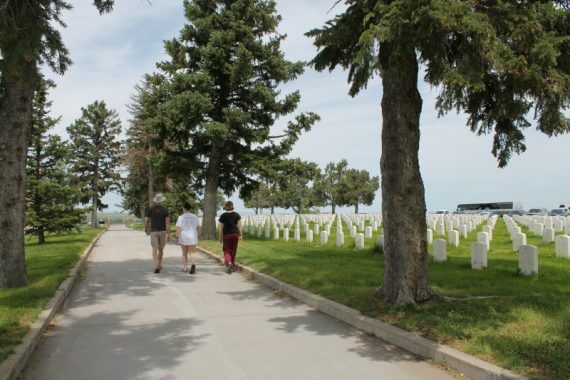 The National Cemetery contains soldiers from Indian wars, both World Wars, and many others. It was quite impressive, reminding you of Arlington Cemetery. 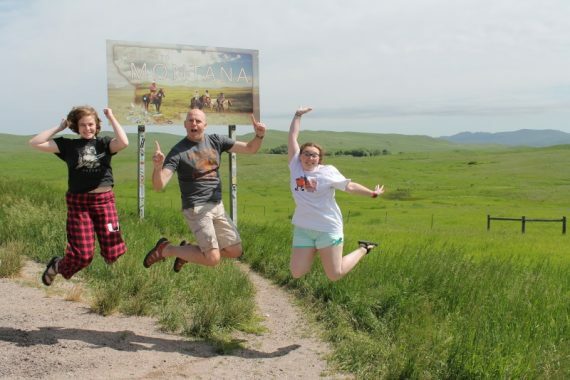 As we left the Monument, Stephanie and Marissa lobbied to visit the Little Bighorn Trading Post and Gift Shop. The gift shop had a healthy supply of souvenirs and a healthy stream of tourists filing in. In the Trading Post parking lot, we prepared our lunch and hit the road for real this time. We left at 1pm and Google Maps said we had 8 hours of driving remaining. Yikes! Time for Stephanie to drive and put the hammer down. Stephanie got us all the way to Bozeman where there was a request from the back seat to stop for Huckleberry ice cream. (A Montana and King family favorite.) Mallory routed us to Sweet Peaks and 3 of us got the Huckleberry. It was as good as we remembered. When we got out of the car in Bozeman it was 55 degrees. We were a little cool in our shorts and t-shirts, but it was nice. However, nearly every person we saw walking around town or in the ice cream shop was dressed for sub-zero weather. Later, Scott told us that the previous day it was 90 degrees in Bozeman, so maybe we will cut them some slack for being shell-shocked. Huckleberry ice cream! Note the parkas seated behind us. 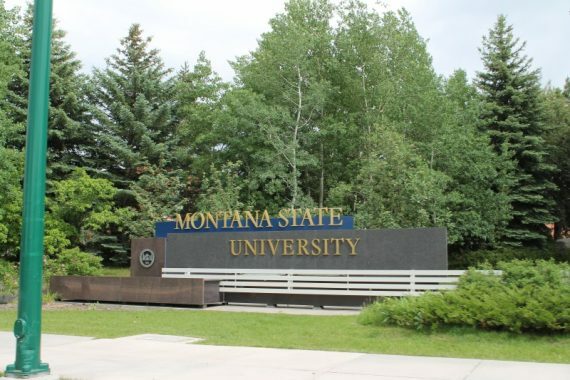 After ice cream, we drove deeper into town to visit the Montana State campus. 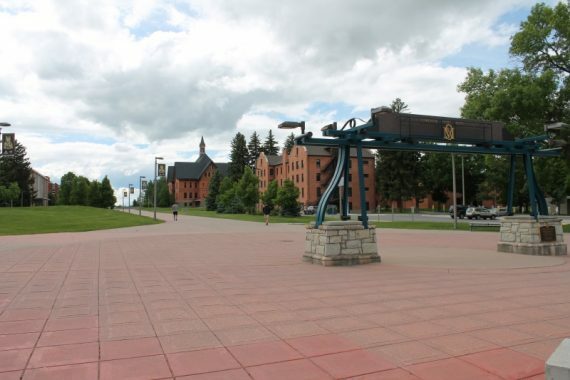 It was a neat little campus, but Stephanie noted that the architecture style was not consistent throughout, which is a pet peeve of hers. There are several routes to get to our destination tonight, Hungry Horse, Montana. We chose to go west through Butte and Missoula. It was very scenic if you like mountain ranges and large western vistas. Driving through Butte was an education. There is an open pit of an old copper mine that dominates the landscape of the town. It is literally the ONLY thing you notice as you drive through. Stephanie did some research to find out that it is now a Superfund site due to the toxic chemicals it has been depositing into the ground and streams for the last 150 years. Old mine in Butte, Montana. 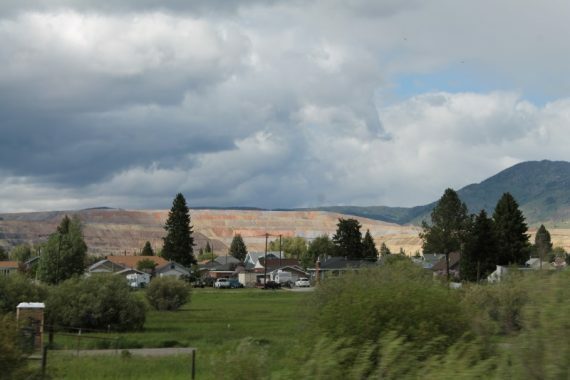 For quite some time, Butte was the richest per capita city in the United States. In the early 1900s, it was the largest city between Chicago and San Fransisco. Butte was a happening place! 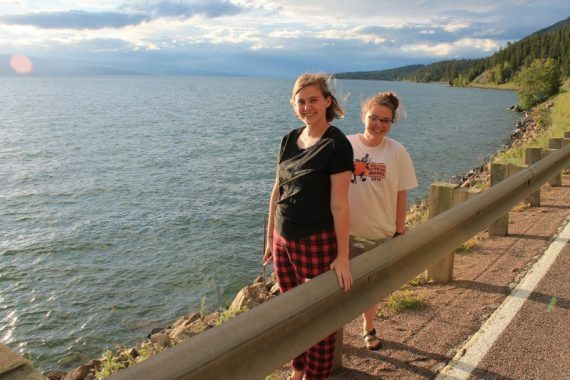 As we neared Hungry Horse, we came up on Flathead Lake. It is a massive natural lake, and is the largest natural freshwater lake west of the Mississippi. I swear it took us an hour to drive around it. Mallory on Highway 36. Traffic was not too bad. We made it to the VRBO around 9:30, roughly an hour after the rest of the family. It was mostly dark when we arrived, but they did share a picture of the view from the back porch with us while we were en route. I think we’re going to like it here! 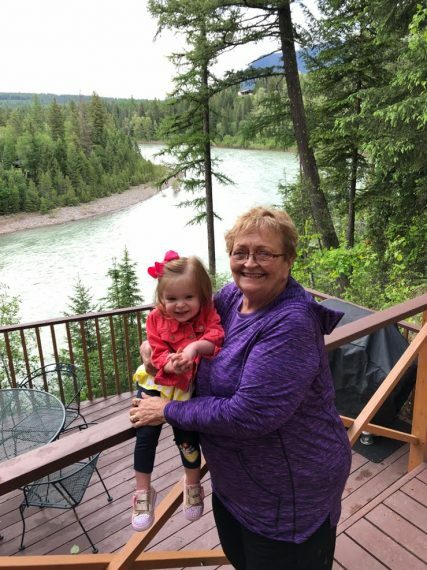 PK and Ellery in front of the Flathead River. What a beautiful trip! It’s always fun to travel with the Kings! 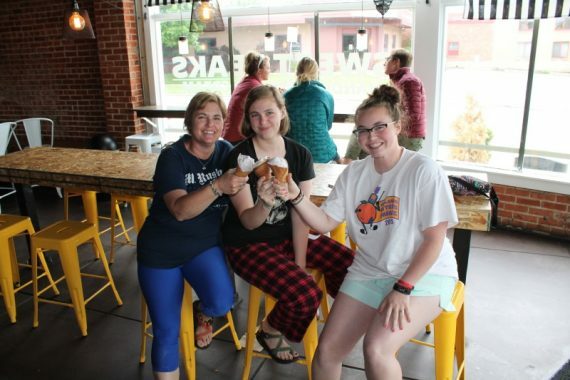 We might need to hire you to plan our fun stops along our drive next month!